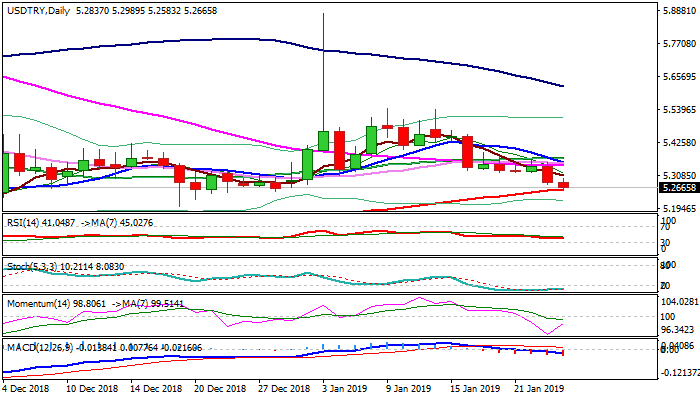 The pair extends bearish acceleration from Wednesday that eventually broke below four-day congestion and testing key 200SMA support (5.2606). Lira remains steady and benefited from recent uncertainty, with additional support from CBRT’s promise to maintain tight monetary policy and to revise the policy in case conditions significantly change. Bearish techs were additionally boosted by formation of 10/20 SMA bear-cross and eventual break and close below the base of thick daily cloud. Positive sentiment around lira suggests that lira longs could extend through 200SMA and expose next key support at 5.1323 (29 Nov low of pullback from all-time high at 7.1074). Alternative scenario on USDTRY dip-buying at 200SMA which acts as strong support, should not be ignored, but such scenario requires sustained break above pivotal resistance zone between 5.3426 and 5.3672 (10/20/30/55SMA’s) to signal reversal and stronger recovery.